Welcome to Cap Juluca's home, Maunday's Bay. 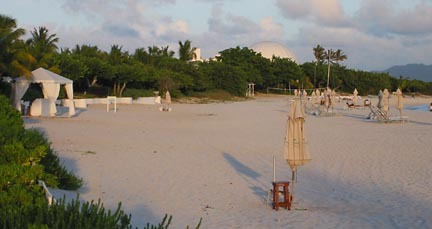 Cap Juluca is the most renowned Anguilla resort. On Anguilla, Cap Juluca is hot. 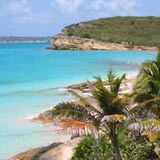 Off Anguilla, Cap Juluca is hotter... the #1 Anguilla resort. From NBC to travel magazines, Cap Juluca really is all the rage. It has been dubbed Best Caribbean Resort countless times, and really, it's no surprise! They have mastered it all... from divine dining, to the luxurious units and grounds, Cap Juluca does it right. And one of its best moves was "location, location, location." Cap Juluca has done a complete overhaul of their central facilities, and builds brand-new luxury villa units. Standard rooms and suites have not yet been renovated, but plans are underway. Click here to see Cap Juluca's renovations. 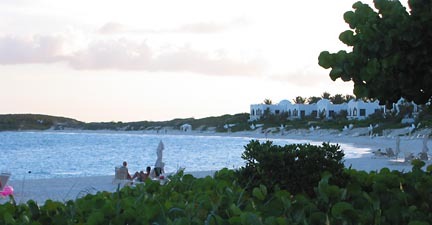 From tip to tip, Maunday's Bay is almost exclusively for Cap Juluca. The units dot the beach, leaving no room for other Anguilla villas or hotels. ... and the warm, turquoise of the Caribbean sea. But there is more to this area than just this world-class resort, warm waters and intimate views of St. Martin. 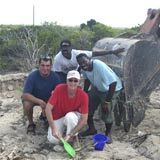 There are a few interesting Anguilla real estate opportunities! The only chance of "getting yours" would be going inland. The views are fantastic! St. Martin's lights at night, Cap Jaluca's in the foreground, the smell of the sea... it's perfect! Plus, land is less expensive inland. It's an opportunity most non-Anguillians overlook. Whether you are set on getting beach front Anguilla real estate here, or think "going inland" is a good idea, you can always check with Jackie Pascher to see what's available and what's not. If dining out while gazing at the night lights of St. Martin is you're idea of a good time, then don't overlook Maunday's Bay. Go inland!